McLaren-Honda’s Formula One team is bad, and it’s not because of the drivers. It’s because the team’s car tends to break and its engine tends to fail. But not to worry, friends and fans of Fernando Alonso—reports are that Honda will bring a slightly less miserable engine to the upcoming Azerbaijan Grand Prix. Honda’s F1 chief Yusuke Hasegawa reportedly told Japanese publication Sportiva there will be “some kind of improvement in the combustion engine” at Baku Circuit, according to Autoweek. That sounds incredibly promising and confident. The news about potential engine improvements comes in the midst of Honda rightfully taking a lot of heat, including McLaren threatening to pay $99.3 million to dump the manufacturer for Mercedes and driver Alonso saying he’ll leave the team if it doesn’t start winning races by September. September isn’t that far away. But they’re not overreacting. The engine is, again, bad. One of the essential components in the Honda engine can only last two races, and the engine didn’t just get bad yesterday or anything—it’s been like this. Hell, a Honda IndyCar engine even destroyed Alonso’s spectacular run in the Indianapolis 500 in May. The report said Honda has been working hard on “specification three” at its facility in Sakura to address the current power unit’s problems, including excessive vibration and a 90-hp performance deficit. 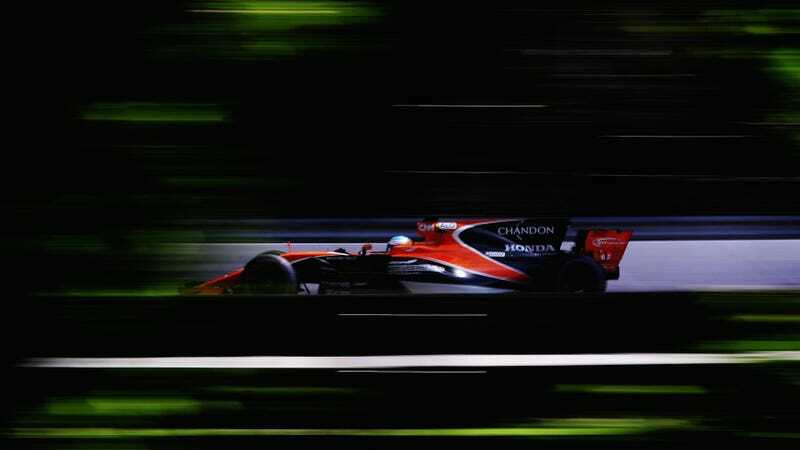 But Hasegawa played down hopes the new engine will completely end Honda’s 2017 troubles. Sure, situations are complicated. Planning a healthy diet is complicated. Reading the letters at the eye doctor when your eyes are bad is complicated. Navigating the continental United States with an Atlas is complicated. Learning how to effectively communicate that peeing on the floor isn’t OK to your cranky old cat is complicated. Life is complicated. Complicated situations are why we have experts, Honda. You’re supposed to be one.